NEW YORK CITY — Massive Hurricane Sandy slammed into the city with deadly force Monday night, causing record flooding, sparking explosions and devastating fires that left a neighborhood engulfed in flames, bringing transportation to a halt and leaving tens of thousands in the dark. Eighteen people were confirmed dead in the five boroughs as a result of the storm that officials called the worst to ever hit the city and left emergency workers scrambling Tuesday to assess the extent of the damage. Mayor Michael Bloomberg said the destruction from Sandy was "maybe the worst that we have ever experienced" and called the challenges facing officials "enormous" with the restoration of subway service and power not expected for days. The tempest left many neighborhoods around the five boroughs under water and sparked nearly two dozen serious blazes that burned in Staten Island, The Bronx, Queens and Brooklyn, leaving some looking like war zones. Thousands huddled in emergency shelters. The situation was so bad that the FDNY had to rescue some 500 people, mainly in Coney Island, Staten Island and the Rockaways. 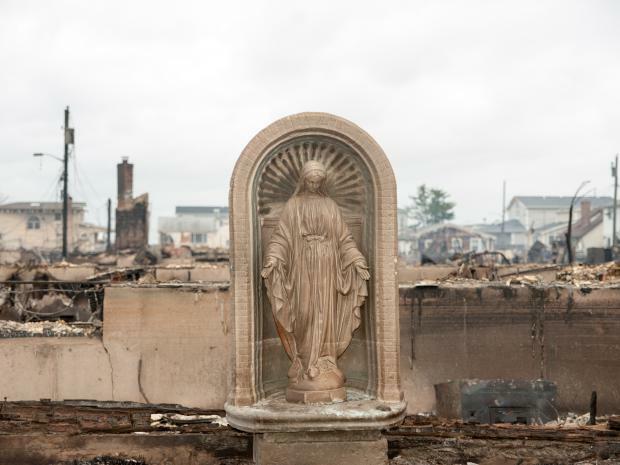 Massive, wind-whipped fires destroyed some 80 homes in the Breezy Point, Queens, which was hit hard by the storm surge, Bloomberg said. Dramatic video shows house after house engulfed in flames as firefighters contended with flood waters. Rescue and recovery operations were ongoing Tuesday, according to the mayor. "We are hoping and praying that there was no loss of life in those fires," the mayor said. "It looked like a forest fire out in the Midwest." Congressman Michael Grimm, who represents Staten Island, called the storm "an absolute disaster" and a "mini-Katrina" for the borough with people who did not evacuate low-lying areas clinging to rooftops as boats floated by and fires were sparked by power lines, according to a spokeswoman. Hospitals there were inundated with hungry and thirsty people seeking emergency supplies, which emergency shelters were running out of, the spokeswoman said. According to officials, water reached as far as Hylan Boulevard, which is half a mile from the shore in places. Most of the bungalows in Cedar Grove were wiped out. Residents in Lower Manhattan, which was hit by a record-breaking 14-foot storm surge, described torrents of water filling the streets at high tide, around 8:30 p.m.
"There was just so much water coming down from the street here, it was literally like Niagara Falls, just coming in and the cars were floating," said Peter Poulakakos, 36, who was working on a building on Stone and William streets Monday night. "There was nothing to be done." There was also massive devastation in Brighton Beach, Brooklyn and flooding in City Island. Among the dead were an off-duty cop and a 13-year-old girl who were found dead in Staten Island and a 75-year-old Manhattan woman who died when her respirator shut off. In Flushing, Queens, a 29-year-old man was killed when a giant tree toppled into his house at 47-36 166th St. just after 7 p.m. Monday. And in South Richmond Hill, Queens, a woman died after apparently coming into contact with live wires in front of 105-05 134th St., near the Van Wyck Expressway, sources said. Tuesday morning, two people were found dead after a report of a falling tree on East 19th Street and Ditmas Avenue in Flatbush, authorities said. Further details were not immediately available. -The subways, commuter rail lines and buses remained out of service. Service was not expected to be restored to the subways for 4 to 5 days, but Mayor Bloomberg emphasized that there was no firm timeline for restoration of public transportation. -Limited bus service may be restored by Tuesday afternoon with the rest possibly going online Wednesday. -Water flowing from taps was deemed safe to drink. -The East River bridges, which were closed to traffic during the height of the storm, were reopened Tuesday and officials were working to reopen other shuttered spans. -Schools were set to be closed for a third day in a row Wednesday and the stock exchange was also shuttered. -The 76 city shelters will remain open Tuesday. Some lost power Monday night, but it was restored. -Area airports remained closed Tuesday with flooded runways. -New York Downtown Hospital and the Manhattan VA Hospital were closed and NYU and Coney Island hospitals were evacuated Monday night. Bellevue was operating on backup power. Con Ed said that the damage to its equipment was the worst in the utility's history after water inundated the system and ferocious winds, which gusted to 90 mph, tore down power lines. Some 750,000 people were left without power in New York City and Westchester County, with the majority of the outages — nearly 200,000 — in Manhattan, where rivers of salt water cascaded into electrical substations. "This is the largest storm-related outage in our history," said Con Ed Senior Vice President for Electric Operations John Miksad. The previous record for outages was 200,000. Monday night, nearly all of Manhattan below 39th Street was left without power after an explosion rocked a substation on the East Side. It was unclear when repairs would be completed, but officials were hoping to get it up and running by the end of the week or sooner. Power could be out for 2-3 days or longer, Bloomberg said. Tens of thousands were also left in the dark in Queens, Brooklyn, Staten Island and the Bronx. The outages came on top of preemptive power shutdowns that cut electricity to 35,000 customers in Manhattan and Brooklyn in order to prevent damage. The raging tempest crippled the city's mass transit, despite the system being shut down more than a day before the storm struck to limit damage. As of Monday night, seven subway tunnels under the East River were flooded and the Long Island Rail Road had to evacuate the West Side Yards because of water. "The New York City subway system is 108 years old, but it has never faced a disaster as devastating as what we experienced last night," MTA Chairman Joe Lhota said in a statement. "Hurricane Sandy wreaked havoc on our entire transportation system, in every borough and county of the region." The Brooklyn-Battery Tunnel was flooded end to end, Lhota said and the Midtown Tunnel was closed after it took on water. And half a dozen bus garages were put out of commission because of high water. "In 108 years, our employees have never faced a challenge like the one that confronts us now," Lhota said. "All of us at the MTA are committed to restoring the system as quickly as we can to help bring New York back to normal." And New Jersey Gov. Chris Christie said that the PATH trains that connect the state to Manhattan would not be back in service for at least 7-10 days, according to the Associated Press. Commuters will be forced to use ferries, he said. Much of the damage was fueled by the massive storm surge that pushed water over seawalls in Lower Manhattan and inundated low-lying areas around the five boroughs. Downtown streets were turned into rivers, partially submerging cars and sending water cascading into tunnels and basements and witnesses said that flooding stretched as far as Avenue C in Alphabet City. Gov. Cuomo said that officials were worried about the structure of the pit at the World Trade Center site and added that there were "some of the worst conditions I've ever seen." 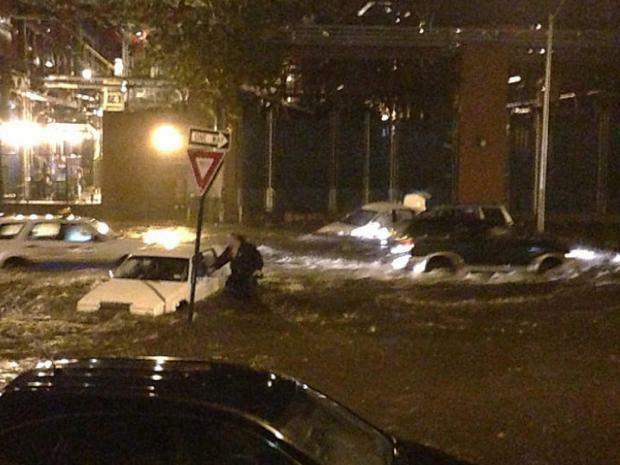 "The Hudson River was pouring into the Brooklyn-Battery Tunnel like a river," he added. Ferocious winds slashed at the city for hours, snapping trees like twigs and scattering debris around the five boroughs. Some 6,000 requests for downed trees and limbs were received, mostly in Queens, according to the Mayor. The highest recorded wind gust was 90 mph in Tompkinsville in Staten Island and gusts of 74-79 mph in Queens. A blast of 62 mph hit Central Park at 3:13 p.m. The powerful winds sent a crane at a 90-story luxury building under construction on West 57th Street toppling onto itself and forcing mandatory evacuations of residents on the street. It was not clear when the situation would be rectified because emergency crews could not secure the boom. Until then, the area will not be reopened to residents and passersby. While the worst of the storm ripped through the city Monday night, forecasters said that the city can expected moderate to major coastal flooding today, according to the National Weather Service. Surges of 3 to 4.5 feet greater than normal could be expected on the south shore of Brooklyn and Queens. Forecasters say to expect tides 2 to 3 feet higher than normal elsewhere. Winds of 20 to 30 mph were expected with gusts to 50 mph and forecasters warned of the possibility of more fallen trees and branches. Breezes were expected to diminish throughout the day.